In practical terms, communication with the author is difficult: we can only communicate through his lawyers. Ahmet Altan’s writing is sprawling, ambitious, radical—so radical that the author is currently serving a life sentence on charges of inciting the plotters behind Turkey’s 2016 failed coup. 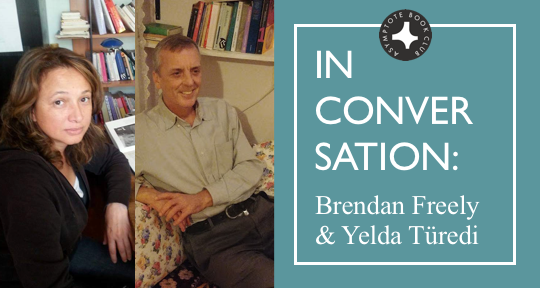 In the latest instalment of the Asymptote Book Club interview series, Altan’s co-translators, Brendan Freely and Yelda Türedi, reveal that their only contact with the author is through his lawyers. No written materials can be carried into or out of the prison where Altan is serving his sentence, but work continues on the final volume of the monumental Ottoman Quartet. In conversation with Asymptote’s Garrett Phelps, Freely and Türedi give us an insight into how they came to translate Altan’s work, and why a novel sequence of novels dealing with the events of the early twentieth century has never felt fresher or more contemporary. Garrett Phelps (GP): Like a Sword Wound is set during a momentous period in Turkish history and details the cycle of chaos which ultimately results in the Ottoman Empire’s collapse. As translators, did you feel the setting added to your burden of responsibilities? Brendan Freely and Yelda Türedi (BF/YT): Both of us are quite familiar with this period, so the setting as such did not present any particular problem. However, we were aware of the echoes of the current political situation in Turkey, and of how little the main political currents seem to have changed in over a hundred years. In practical terms, although Like a Sword Wound was written in modern Turkish rather than Ottoman Turkish, Ahmet Altan made an effort to reflect the language of the period, often choosing outdated words and phrases. In our initial meeting to discuss the translation, he was concerned about how we would approach this. We agreed to take the same approach he did—that is, to prefer older words and phrasing to evoke the mindset of the period while still keeping the language current enough to avoid alienating contemporary readers.